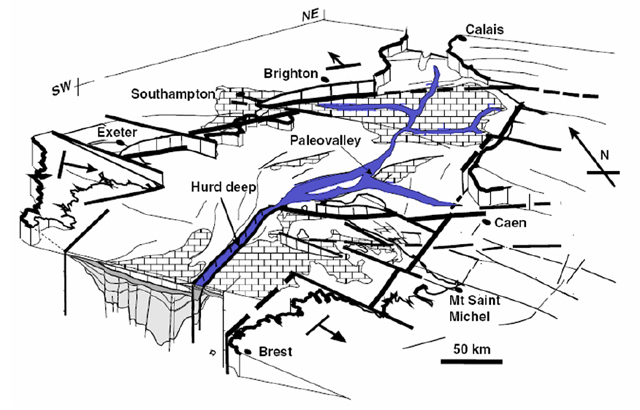 Manche (or Channel of the English people) is a sea épicontinentale (=reposant on a continental crust) shallow (-172 m at most) the origin of which is rather recent (Pleistocene, 2,6 My in - 11 400 years). Previously, in the Pliocene (5,3 - 2,6 My), he had to exist a line of bank at the level of current western Manche, but the main part of his surface was exshower. The river system, particularly River Manche. The Manche system finds its origin in a reactivation of main directed weaknesses N60 ° during the phase compressive Pyrenean Eocene / Oligocene. The result is the opening of ditches half--graben, as that collectively was called Central Pit or Hurd Deep. 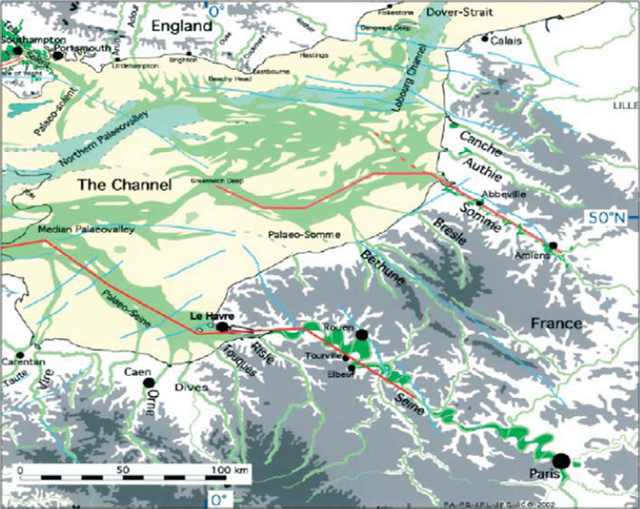 At the level of the French-British strait, a fold anticlinal joins English Weald in French Artois, it is Anticlinal Weald artois. There is approximately 4 My, for not yet completely clarified reasons, occurs a progressive cooling of climates. Climates oscillate between a cold phase =(glaciaire) and a warm phase =(interglaciaire). This cyclicité is under the dependence of the parameters of Milankovitch. Yet, we attend, during the Pleistocene, the passage of a dominant period of 41 000 years in a period of 100 000 years. The transition is made years ago approximately 900 000 and is called Revolution of the Average Pleistocene (MPR in English). This change of rhythm is going to cause an evolution different from icecaps: before, they remain confined in the high latitudes; later, they become massive and "come down" towards the average latitudes in the north hemisphere. The history of these big glaciations of the average-upper Pleistocene begins to be better deciphered thanks to multidisciplinary approaches today. Fast glacial ending, less than 10 000 years. The main cause of the phenomenon glaciation-déglaciation is the variation of the summer sunstroke in the north hemisphere. This one melts the ice accumulated during the winter. When this one she is maximal? When the eccentricity and the obliquité increase. The marine seismic survey allowed to map river systems of marine bottom - level (or paléovallées, in green on the face) which were set up during the Pleistocene in the oriental part of Manche. Former river system, according to Antoine and al. (2003) and Larsonneur (1982). The River Manche during the last glaciation (25 - 20 ka).